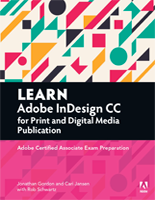 Used by graphic designers worldwide, Adobe InDesign CC is a layout powerhouse. This study guide uses more than 11 hours of video integrated with text to help students gain real-world skills to get started in designing publications for print and screen using InDesign CC. It lays the foundation for taking the Adobe Certified Associate (ACA) certification exam and helps prepare students for an entry-level position in a competitive job market.